Well this isn’t what I wanted to find. Just got the phone today and got it all set up and put in a case and suddenly noticed light all along an edge of the device coming out from under where the glass of the screen meets the metal frame! That’s not right I am sure. Anyone else see this? Lol. Yeah, mood lighting I guess kinda like hue light strip for my phone. It is not light leak, it is due to the screen being curved and a white screen at 100% brightness reflecting off the frame. 103Softail, buzzy3970, djrakowski and 4 others like this. Don’t think so unfortunately. Brightness was at about 10-15% in that, and it is only on one side. Plus if I block the light from the screen, it still is there. It's the way the phones are manufactured....painting process. Some will have more pronounced light bleed where others don't. It's a price of the curved screen Yada Yada. My Note 7 had it.... S8+ didn't. 1st Note 8 and 2nd have it. Erica Griffen I think is her name did a video on this 1 or 2 years ago. You can gamble send it it back (or to me ) and see if you get one thats not so bad. 103Softail and Gray Area like this. Also, I can still see it when in a case that is matte rubber along the edge there, so shouldn’t be reflecting anything. Yeah, that’s kinda what I was thinking may be the case. It’s like the black paint along the edge of the glass wasn’t extended far enough. Hum. Never had any of this on my Galaxy S8 or my Note 8. 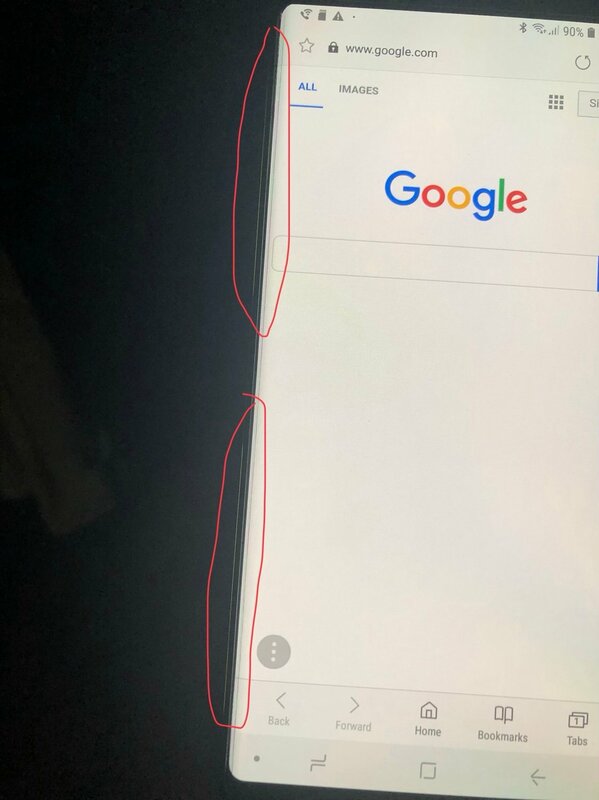 Yeah, Sammy support is saying it is a “phenomenon of the curved display.” Strange because I have had many of their curved displays over the years and this is a first for me. Lucky. Can't say I've ever paid attention to it on my phones, but I've definitely read about on the forums for every curved screen phone since the Note 7. I personally try not to look for it so it won't bother me. buzzy3970, cwbcpa and Morty2264 like this. I can never see issues like this from a picture. My phone will be in a case, I will likely never even see this. Luckly I don't and un of my other Samsungs have ether. Yea it always seemed to be in a different spot for me. You could always just send it this way since I'm still waiting on mine. bassplayrguy, jlangner, trucksmoveamerica#AC and 5 others like this. Surprised we made it this long for this thread. bassplayrguy and cwbcpa like this. Oh no, there have been quite a few complaints. The battery has been Guess-reported as average at best, and lets not forget if you beat on your phone with a razor knife the buttons might come out. Finally, there has been the guy who said the camera sucked in low light compared to his _____ (whatever) phone. Update... I forgot the no S-Notes thread, and the no IR blaster comment I saw a few threads back. There is also a thread about how the screen isn't bright enough. People like to hate. stackberry369, bassplayrguy, areyes163 and 5 others like this. It's a feature called SamStrobe. Pop out the removable buttons and it turns your phone into a strobe light. fishmd and TwitchyPuppy like this. I like that. Or SamHue. They should market it I guess. Unfortunately they apparently can’t always replicate the effect. Are you sure it’s a real one? It’s not even out, yet.